Jade Powell was waterskiing when she noticed something funny in the water of Myers Lake, in Courtland Township, Sunday, September 16. The lake was full of freshwater jellyfish! Thousands of jellyfish could be seen from the Powell’s pontoon boat on Wednesday, September 12. “I put my feet in the water when I saw them. I thought they looked like jellyfish,” she said. She was right. From that Sunday until at least Wednesday the following week, the warm waters of Myers Lake hosted thousands of swimming jellyfish. According to Michigan Department of Natural Resources Fisheries Biologist Mark Tonello, the freshwater jellyfish are quite common in Michigan’s lakes. He said they traditionally are spotted in lakes throughout Michigan in the fall and can be in large numbers. The jellies are harmless to humans and don’t seem to be eaten by fish, at least in his observation. 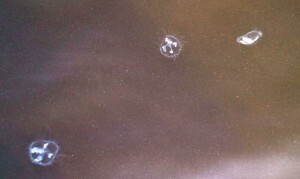 Tonello said the whitish, translucent jellies in Myers Lake are typical, but he has seen them with blue or purple hues. Unlike saltwater jellyfish, which can be larger and tougher—and sting people—the little Michigan jellies likely disintegrate after death, the reason their dead bodies aren’t found on shore as they are at the seaside. “They are so fragile they probably just disintegrate when they die,” he said. Not claiming to be an expert on this non-fish hydrozoan, Tonello said he has never heard of them in streams, rivers or the Great Lakes. He said the small creatures do have stingers that they use to catch food but can’t sting humans. Internet research finds the jellyfish, craspedacusta sowerbyi, are known to exist on every continent in the world except Antarctica and are believed to have originated in the Yangtze River in China, where they are found today and where they are a native species. They were first discovered elsewhere in the lily tank ponds in Regents Park, London in the 1800s where they likely were introduced as polyps in the imported Chinese lilies. They often “bloom” in large numbers, mostly in still, warmer waters, in the fall. They feed for a week or two, and asexually reproduce by creating polyps that sink to the bottom of lakes, where perfect conditions and timing cause them to develop into the jellyfish such as the Powells found. Jars of Jellies—The Powell family have caught lots of bluegills, bass and perch from Myers Lake, but never before caught jellyfish. 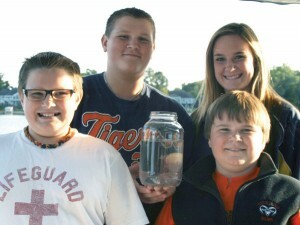 Jade, Vance, Gage and Chase Powell are pictured with a jar of the freshwater creatures they scooped up from the lake on Sunday, September 16. Tonello said there are lots of things in our Michigan ponds and lakes that would amaze and astound residents, such as a predacious water beetle that reaches the length of three inches. He also said he had to look up a huge specimen eventually identified as a waterbear. He said the thing was a type of plankton about the size of a quarter with a quite startling appearance. He said residents would not, however, find any of the following in our local waters: starfish, squid, anemonies, puffer fish, urchins or seahorses. Jade Powell said, after her initial alarm and after the family captured and carefully handled a few of the jellies, she lost her concern over their potential danger. She continued her waterskiing despite thousands of swimming jellyfish around her. Such an activity would probably cost her several hundred dollars if it were a tourist attraction at Seaworld. Given the difference between the benign jellyfish in Michigan and the stinging nature of the saltwater variety, that likely won’t be available anytime soon.